Most everyone knows the story of Edmond Dantès, the wrongfully-incarcerated (and consequently revenge-obsessed) hero of Alexandre Dumas’ 1844 novel The Count of Monte Cristo. But did you know these 15 facts about the classic? 1. THE PREMISE WAS INSPIRED BY A REAL LIFE STORY OF A VENGEFUL SHOEMAKER. Dumas’ appetite for action-packed tales led him to the 1838 publication Memoirs from the Archives of Paris Police, a collection of true crime stories arranged by author Jacques Peuchet. Among the accounts featured was the particularly macabre tale of Nîmes-born shoemaker Pierre Picaud, who was framed for treason by three men who lusted after his wealthy fiancée. Popular appropriation of the legend of Picaud has him earning the affection of someone wealthy and childless (possibly a priest) he was assigned to serve. After the man died, Picaud became his sole beneficiary and extremely wealthy. Later, on Picaud’s deathbed, he offered a small fortune to one of his friends, Allut, for the name of those who betrayed him. After getting the information, Picaud (who had been faking his death) went on to pursue increasingly vicious revenge quests against the three men who wronged him, saving the most brutal sentence for the man who went on to marry Picaud’s fiancée. And after killing the third conspirator, Picaud himself was murdered by Allut, the friend who had identified the betrayers. 2. THE COUNT OF MONTE CRISTO DREW FURTHER INSPIRATION FROM THE AUTHOR’S FATHER. A swashbuckler in the tradition of great literary heroes, Thomas-Alexandre Dumas—born Alexandre Davy de la Pailleterie—certainly epitomized the “self-made man” characterization that made the titular Count such a winning figure. Born in the French colony of Saint Domingue to an enslaved African mother, Thomas-Alexandre followed his nobleman father back to mainland France, pursuing formal education and military enlistment. Ultimately seizing a position as a general, Thomas-Alexandre still holds the distinction of being the highest-ranking person of color in a Continental European army. 3. DUMAS GOT THE TITLE FROM A BOAT TRIP HE TOOK WITH NAPOLEON’S NEPHEW. Knowing little of the author’s proclivity for impromptu seafaring expeditions, Jerôme Bonaparte—former King of Westphalia and brother of Napoleon—asked Dumas to play host and tour guide to his 19-year-old son, also named Napoleon, during his visit to Italy in 1842. Dumas encouraged the young prince to brave an ad-hoc boat trip, enjoying stops at the islands of Elba, Portoferraio, and ultimately the remote landmass Montecristo. Although Prince Napoleon grew quite ill on the trip, Dumas was so taken with the latter isle’s geological beauty and ample game that he vowed to name his next (and ultimately most successful) novel for it. 4. THE STORY WAS RELEASED AS A SERIAL OVER A TWO-YEAR SPAN. 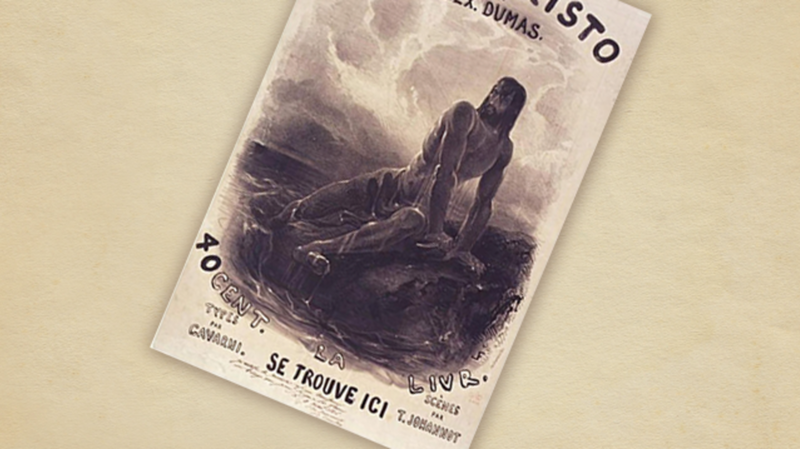 Following its completion in 1844, The Count of Monte Cristo was first printed by Journal des débats. The French newspaper offered the story as a regular serial, publishing the first of 18 segments on August 28, 1844 and the final on January 15, 1846. The Count of Monte Cristo’s original hardcover incarnation also used this method, publishing likewise as a series of 18 distinct volumes between 1844 and 1845. 5. THE BOOK WAS ORIGINALLY PUBLISHED WITH ITS TITLE MISSPELLED. The editions published in this time period, and most of those released through the 1850s, bore the kind of spelling error that keeps copy editors awake at night. These early copies of the book were published as The Count of Monte Christo. It was 1846 before the first correction of this flaw was made, and only in 1860 did the circulation of correctly spelled copies outstrip the erroneous ones. 6. EARLY PUBLICATIONS OF THE BOOK REMOVED REFERENCES TO HOMOSEXUALITY. Although Dumas never outright confirmed that his Count of Monte Cristo characters Eugénie Danglars and her music teacher Louise d’Armilly were sexually and romantically involved, his allusions on the topic were enough to stir the ire of some conservative publishers of the era. Contemporaneous English-language translations of the novel deleted scenes showcasing the characters’ intimate relationship—including one featuring the pair lying in bed together—which would only reappear in English-language translations 150 years later. 7. A FAMOUS AUTHOR’S WIFE MADE ONE ENGLISH TRANSLATION OF THE NOVEL. A number of English-language translations of The Count of Monte Cristo entered circulation in the years following the story’s initial publication. An unabridged interpretation of the text reached England in the mid-1800s via the good graces of Emma Lavinia Gifford, the wife of novelist Thomas Hardy. 8. NOBODY KNOWS WHO TRANSLATED ANOTHER EDITION. However, the most widely circulated English version, published in 1846, never carried the name of its translator. The book was identified only by the name of its publishing company, Chapman and Hall. 9. THE COUNT OF MONTE CRISTO WAS THE MOST POPULAR BOOK IN EUROPE. English writer and historian George Saintsbury, born just after the initial publication of the novel, estimated in an 1878 issue of The Fortnightly Review that The Count of Monte Cristo was, “at its first appearance, and for some time subsequently, the most popular book in Europe. Perhaps no novel within a given number of years had so many readers and penetrated into so many countries.” Granted, Saintsbury went on to malign said popularity, decreeing that only the first volume of the story, if any fraction, ever truly deserved such praise. 10. ANOTHER CLASSIC NOVEL WAS INSPIRED BY DUMAS’ STORY. Thirty-six years after Journal des débats first published The Count of Monte Cristo, American politician, lawyer, and army general Lew Wallace turned his own hobby of creative fiction into a bona fide career with the novel Ben-Hur: A Tale of the Christ. Chief among the novels that influenced the part-time author’s tale was Dumas’ revenge epic, and he even likened himself to the Count during the writing of Ben-Hur in his autobiography. 11. ONE PUBLISHER ATTEMPTED TO MAKE THE LANGUAGE MORE ACCESSIBLE. 12. A WELL-KNOWN BRITISH COMEDIAN WROTE A “MODERN UPDATE” OF THE NOVEL. Stephen Fry, though celebrated most for his humorous exploits, is hardly without his successes in the realm of drama. Alongside Golden Globe Award-nominated performances and thoughtful documentary projects are Fry’s literary feats, one of which is his 2000 thriller, The Stars’ Tennis Balls, a modern-day retelling of the Count of Monte Cristo story. 13. THERE HAVE BEEN 40 SCREEN ADAPTATIONS OF THE COUNT OF MONTE CRISTO. Dumas ranks among the likes of William Shakespeare, Charles Dickens, and Fyodor Dostoevsky on the list of writers whose works are most frequently adapted for the big screen. The Count of Monte Cristo trounces even Dumas’ own duly popular The Three Musketeers in its translations to the moving picture, boasting at least 40 individual depictions across the media of film and television. The Count of Monte Cristo’s relationship with cinema dates all the way back to 1908, when the short film Monte Cristo was released in Italy by director Luigi Maggi. 14. THE STORY GAVE ONE FAMOUS SCREENWRITER HIS PEN NAME. Due to the cunning duplicity of Dumas’ hero Edmond Dantès, his name has become a popular alias throughout pop culture. Some figures have even adopted the moniker as a nom de plume, notably one renowned screenwriter. Although Dantès is the name attributed to scripts for the films Beethoven, Maid in Manhattan, and Drillbit Taylor, they were each written by teen flick icon John Hughes. 15. IT'S LENT ITS NAME TO A VERY UNHEALTHY SANDWICH. In the 1920s, a deep fried sandwich consisting of white bread, ham, turkey, and Swiss cheese was developed, most likely in California. Based on the French croque monsieur, it became popular in the '40s under the name Monte Cristo. While no one is sure about the name’s origin, the timing (and spelling) has led many to believe that it was named after the movie adaptations that were so popular at the time.